I always see promotions for shows on television, think to myself “I want to watch that when it comes out”, and then forget to tune in when they premiere. 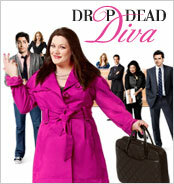 “Drop Dead Diva” was one of those shows. It looked like something I’d really enjoy but by the time I realized the season had started, it was over. Lifetime recently sent me the first episode of the 2nd season (which premieres tomorrow, June 6th, at 9pm ET/PT) to review and I loved it. I won’t miss a single episode of Season 2 because I have already set a series recording for it on my DVR. I have to admit that for the first couple minutes I was thinking “what in the world is this?” because there was singing and dancing and it looked like a bad music video. After a few minutes were up I realized that Jane (played by Brooke Elliott) was just dreaming and I breathed a sigh of relief. At the end of the episode I found myself wishing that I didn’t have to wait a couple of weeks to see the next one because I was curious as to what would happen with the men in Jane’s life. Whether you haven’t seen an episode or can’t wait for season 2 to start, don’t forget to be watching tomorrow night!